My Life Story Group has met three times now and every time has been SO lovely — full of honesty, vulnerability, laughter, tears, love, and food. I told my life story at the first meeting (yikes) and since then Katie and Sandi have also both shared. What a group of amazing women, seriously. I love our casual get-togethers where, in addition to baring our souls, we play with each other’s pets, share Spanish language trivia (Sandi is Colombian and Katie spent a lot of time in Guatemala. And I’m a … good listener? ), and EAT. Katie makes moist banana bread, killer baba ghanoush and red pepper hummus, and always shares fresh fruit or veggies. Sandi shares Colombian treats and makes amazing arepas. I make a mean artichoke dip, if I do say so myself (it’s actually Mike’s mom’s recipe, so I can brag on it.) Next meeting, I’m going to kick the heat up a notch with these adorable Chipotle Shrimp Cups. They look so fancy, right? But they’re seriously ready in 20 minutes flat! 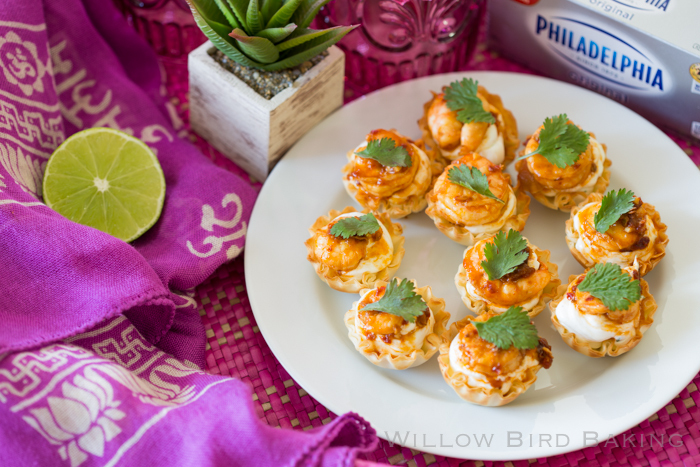 These little finger foods start with crisped phyllo cups straight from the grocery store freezer aisle. Before topping them with my favorite chipotle shrimp recipe from Grandbaby Cakes, I filled them with a mixture of sour cream, Philadelphia Cream Cheese, and green onions. I always keep Philadelphia Cream Cheese on hand because it’s made with fresh milk, real cream, and no preservatives — nothing else tastes like it. I’m going to stick this mixture in all sorts of Tex-Mex treats in the future (oh my gosh, it’d be so good in enchiladas); it was tangy, creamy, and delicious under the spicy shrimp! Garnish each bite with a cilantro leaf before devouring. These little bites look so fancy, but are actually ready in 20 minutes flat! 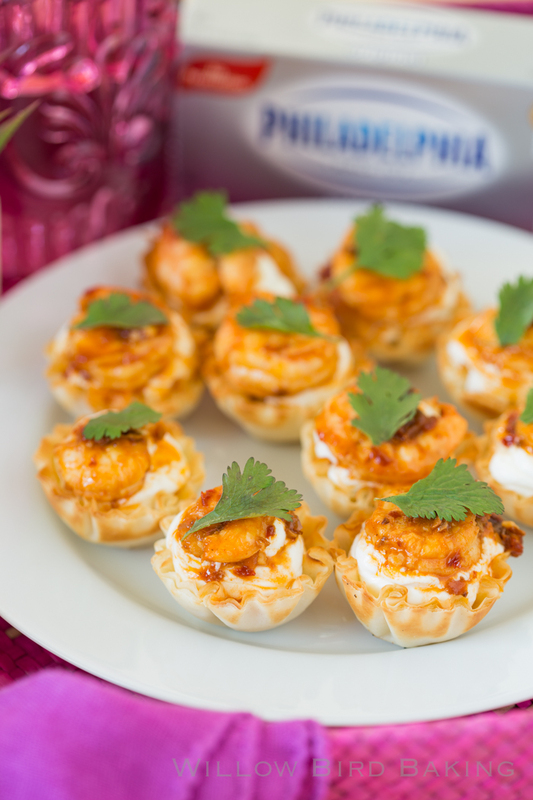 A tangy, cream mixture of cream cheese, sour cream, and green onions is piped into crispy phyllo cups and topped with spicy chipotle shrimp. You won't be able to eat just one! Crisp the cups: Preheat the oven to 350 degrees F. Crisp your phyllo cups on a parchment-lined baking sheet in the oven for 5 minutes before setting aside to cool completely. Fill the cups: When the cups are cool, whip the Philadelphia Cream Cheese, sour cream, green onions, salt, and pepper together. Transfer this mixture to a zip-top bag with the corner cut off and fill each phyllo cup. Make the Chipotle Shrimp: Process the chipotle peppers and sauce in a food processor until smooth. Place the puree, shrimp, and garlic together in a zip-top bag and gently work the bag around until the shrimp are well coated. Place the shrimp in the refrigerator for 20 minutes to marinate. Heat the olive oil in a large skillet over medium heat until it shimmers. Add the shrimp and sauce to the pan and sprinkle with salt and the lime juice. Cook for around 4 minutes, tossing the shrimp as needed, until the shrimp are cooked through. Remove from the heat and gently mix in the butter. Assemble: Top each filled cup with one shrimp and a leaf of cilantro. Serve warm. For quick and easy entertaining, turn to Philadelphia Cream Cheese. Always have it on hand to create fun appetizers and desserts that pop. I had a great time developing my Chipotle Shrimp Cups for my life story group. For more creamy, delicious recipe ideas, click here. What a great party appetizer idea! I need this recipe in my life…I love the chipotle flavor! I love using those tiny cups for appetizers – so cute. And chipotle shrimp – yes, please! Gorgeous little apps and SO EASY!!! Gotta love chipotle. These look delightful for spring! Love shrimp appetizers. Oh, I love getting together with friends and cooking for each other! 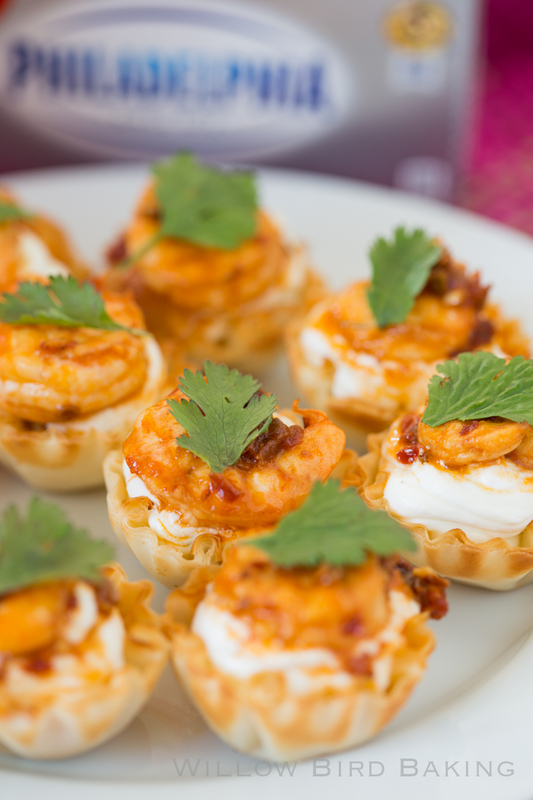 I’m sure these shrimp cups will be a hit at your next gathering! what a great presentation! love finding new ways to serve shrimp. My four year old is OBSESSED with shrimp lately so we are always on the look out for new recipes!! That filling sounds incredible! I absolutely love Philadelphia cream cheese in savory dishes and should make more recipes like this (rather than mostly just sweets!). These cups look like the perfect quick and easy appetizer!